Vocal Duet. Composed by Andrew Lloyd Webber. Vocal Duet. Broadway. Vocal/organ single. With lyrics, vocal duet notation, organ registrations and organ accompaniment. 4 pages. Published by Hal Leonard (HL.363607). High Key (original) with organ accompaniment. Working with organist to play this as a violin and organ duet. Clean print with larger notes on this sheetmusic makes this variation easy to do. Pleased to have this coipy with organ accompanyment. Well doner and very useful for an organist. 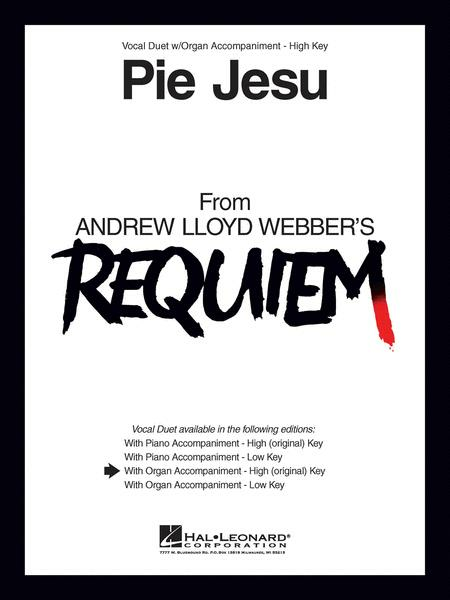 The arrangement of the piece is technically not demanding; but Andrew Lloyd Webber is able to give gentle comfort to those in grief. 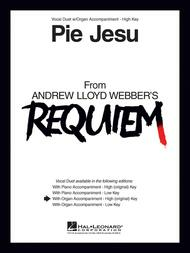 What "Pie Jesu" demands from those who perform the piece is empathy with the bereaved, belief in divine benevolence, and human kindness.